Shaman are spiritual beings with the ability to heal, work with energies and 'see' visions. 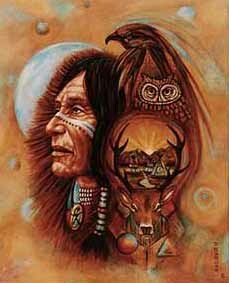 The essential characteristics of shaman are mastery of energy and fire as a medium of transformation. A shaman may exhibit a particular magical specialty - such as control over fire, wind, magical flight, or shape shifting. In contemporary, historical or traditional shamanic practice the shaman may at times fill the role of priest, magician, metaphysician or healer. Personal experience is the prime determinant of the status of a shaman. The distinguishing characteristic of shamanism is its focus on an ecstatic trance state in which the soul of the shaman is believed to leave the body and ascend to the sky (heavens) or descend into the earth (underworld). The shaman makes use of spirit helpers, with whom he or she communicates, all the while retaining control over his or her own consciousness. The ability to consciously move beyond the physical body is the particular specialty of the traditional shaman. These journeys of Soul may take the shaman into the nether realms, higher levels of existence or to parallel physical worlds or other regions of this world. Shamanic Flight, is in most instances, an experience not of an inner imaginary landscape, but is reported to be the shamans flight beyond the limitations of the physical body. While most shamans in traditional societies are men, either women or men may and have become shamans. Traditional shamans developed techniques for lucid dreaming and what is today called the 'out-of-the-body experience'. These methods for exploring the inner landscape are being investigated by a wide range of people. Some are academics, some come from traditional societies and others are modern practitioners of non-traditional shamanism or neo-shamanism. Along with these techniques, the NDE or near-death-experience have played a significant role in shamanic practice and initiation for millennia. The term 'Shaman' comes to the English language from the Tungus language via Russian. Among the Tungus of Siberia it is both a noun and a verb. While the Tungus have no word for shamanism, it has come into usage by anthropologists, historians of religion and others in contemporary society to designate the experience and the practices of the shaman. Its usage has grown to include similar experiences and practices in cultures outside of the original Siberian cultures from which the term shaman originated. Shamanism is classified by anthropologists as an archaic magic-religious phenomenon in which the shaman is the great master of ecstasy. There is extensive documentation of this in ethnographic studies of traditional shamanism. With this renewed interest in these older traditions these shamanic methods of working with dreams and being conscious and awake while dreaming are receiving increased attention. As noted in this article, the 'call' to shamanism is often directly related to a near death experience by the prospective shaman. Among the traditional examples are being struck by lightening, a fall from a height, a serious life-threatening illness or lucid dream experiences in which the candidate dies or has some organs consumed and replaced and is thus reborn. Survival of these initial inner and outer brushes with death provides the shaman with personal experiences which strengthen his or her ability to work effectively with others. Having experienced something, a shaman is more likely to understand what must be done to correct a condition or situation. While shamanism may be readily identified among many hunting and gathering peoples and in some traditional herding societies, identifying specific groups of individuals who might be called shamans is a difficult task in more stratified agricultural and manufacturing based societies. A society may be said to be Post- Shamanic when there are the presence of shamanic motifs in its traditional folklore or spiritual practices indicate a clear pattern of traditions of ascent into the heavens, descent into the nether- worlds, movement between this world and a parallel Otherworld, are present in its history. Such a society or tradition may have become very specialized and recombined aspects of mysticism, prophecy and shamanism into more specialized or more "fully developed" practices and may have assigned those to highly specialized functionaries. When such practices and functionaries are present or have replaced the traditional shamans found in historical or traditional shamanism the use of Post-shamanic is appropriate. Knowledge of other realms of being and consciousness and the cosmology of those regions is the basis of the shamanic perspective and power.